Imogen's Typewriter. : Books I Took to Northumberland: Take Two! Now, last time I went to Northumberland, I took twenty books. This time I filled up exactly the same box but clearly my Tetris skills are waning because I only seem to have managed to fit sixteen in. All my currently reading went in first, then it was proofs, and some from my Summer TBR, then whatever the heck I wanted that could fit. So what made the cut? 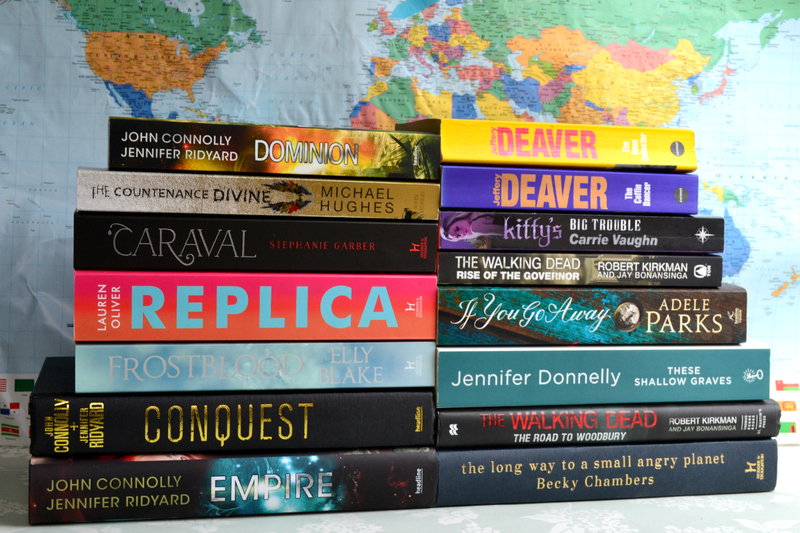 Conquest by Jennifer Ridyard and John Connolly was a current read that I immediately added to the box, shortly followed by Empire and Dominion*. Yes. I've actually started my re-read of this series and it's all very exciting. The Countenance Divine by Michael Hughes* was a book I was reading but I've since paused. It sounded really interesting and I'm curious about how the story ends, but the lack of female characters and the way women were spoken about made me too uncomfortable to continue this one. Kitty's Big Trouble by Carrie Vaughn is another of the books I was currently reading and the one I read for the first couple days of my holiday. It even featured in my monthly wrap-up. I really enjoy these books and I definitely want to pick up the rest of the series as soon as my back account allows. And my last currently reading auto-pack was The Long Way to A Small, Angry Planet by Becky Chambers*. I'm not only currently reading this, I'm reading it aloud to a friend of mine. I really want to finish it before the sequel; A Closed and Common Orbit comes out in October but reading aloud takes a surprising amount of time! I try never to go away without a Deaver and since I live in horror that I'll finish a book and not have the sequel with me, I brought along The Bone Collector and The Coffin Dancer. These are the first two books in the Lincoln Rhyme series that I've been meaning to re-read for a while. Frostblood by Elly Blake, Caraval by Stephanie Garber and Replica by Lauren Oliver* are all proofs of books coming over the next six months and I'm so excited about all of them. Seriously excited. They all sound amazing and I couldn't leave them at home, even if I only started one of them! And on the YA front, I apparently wasn't satisfied because I shoved These Shallow Graves by Jennifer Donnelly in too. I recently passed The Governors storyline in The Walking Dead comics and since The Walking Dead: Rise of the Governor and The Road to Woodbury cover his story pre-comics, I figured I didn't have to be completely caught up in the comics to re-read them. And lastly, If You Go Away by Adele Parks* was actually in my handbag and hitched a ride without me noticing until I got here but I'm actually pleased. I promised my dear readers a full review and haven't delivered yet so this gives me a good opportunity to work through my sticky notes and write a hopefully coherent blog post about how amazing this book is. In all honesty, I didn't even get much reading done though! It didn't turn out to be the relaxing holiday I had hoped for. But, better to have a lot of books and not read them, then finish a lot of books and have nothing left to read! Right? Am I the only one that over-packs books for holiday?